At Sturbridge Yankee Workshop we have a large selection of collectible Santa sculptures and figurines for the upcoming holiday season. From mantle decor to a great gift, our St. Nicks are sure to please. Santa has been given many names over the years. Santa, Santa Claus, St. Nicholas, St. Nick, Father Christmas, and the list goes on if you begin including variations from other languages. The roots of where the name ‘Santa Claus’ originated from, stem from a combination of folklore in Germany, Scandinavia, Holland, and Great Britain. Whatever you choose to call this jolly gift giving man in your home, he always finds a place in our hearts. 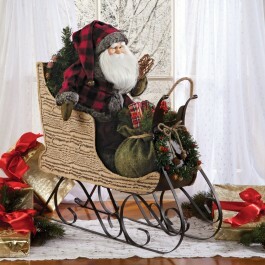 Our Santa & Sleigh Centerpiece shown here to the left, is a good place to start with our Santa decorating theme. This large sleigh makes for a striking display in the center of a table, perhaps in front of the fireplace or even beside the tree. A wreath on the front of Santa’s sleigh, his plaid terry fleece coat with white fur trim and “snow” dusted berries, are just some of the amazing details you will enjoy making note of. 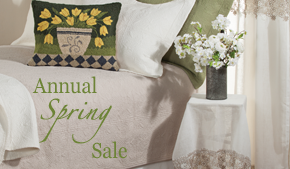 Customers will appreciate that this item is on sale for $20 off the original retail and will SHIP FREE. At Sturbridge, we have many smaller Santa collectibles too, if you prefer. 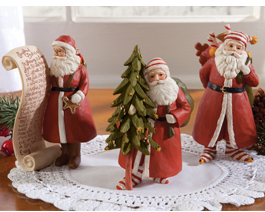 These Santas are great for mantle or shelf displays, and also make great gifts. Seen here to the left is our new for holiday 2012, Recipe, Tree & Toy Bag Santas. Designed by Mary Beth Baxter, you’ll appreciate their engraved detailing. Available now with free shipping for just $19.95 each, they are adorable figurines when shown off together. Another grouping of miniature Santas offered this season, is our Carved Folk Art Santas, designed by artist Lori Miller. Here you might find Santa with some unusual methods of delivering this year’s presents. Also shipped for free this holiday season, these carved wood replicas can be purchased for $49.95 to $54.95. Santa has decided to take up some activities this winter in order to keep active. Pictured here on the left, is our finely crafted Santa with Wooden Skis. 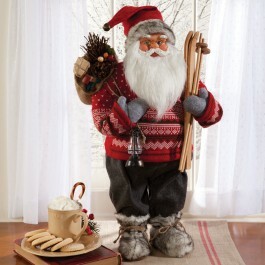 This collectible Santa sculpture is ready for the slopes with his wooden skis, poles, and a cozy red and white knit sweater. Though of course he can’t forget his burlap sack, full of gifts and fruit on the next run down the mountain; now $69.95 with free shipping. For those who prefer snowshoeing instead, a customer favorite Santa from last year, our Chickadee Santa, is a nice alternative. Conversely, Santa is dressed in a deep green velvet, long winter coat with hood. Detailed accents of chickadees perched on pinecone branches on both sides, a faux fur trim, and a unique Norwegian inspired pattern, make this Santa’s coat one to be desired. The Chickadee Santa Collectible is available now for $59.95 with free shipping. So whether you’re adding to your personal Santa collection or giving as a gift, any one of these Santas could soon become a Christmas time favorite in the home. ~ To browse more Santa Decor not featured, click Here. This entry was posted on Monday, November 26th, 2012 at 9:18 am	and is filed under Decorating, Gift, Holiday Decorating, Seasonal Decorating. You can follow any responses to this entry through the RSS 2.0 feed. You can leave a response, or trackback from your own site.